The HP SPECTRE X360 13-AC063DX is another laptop PC comes packed with 7th Generation Intel Core i7-7500U ultra low voltage processor that features 4 MB level 3 cache and runs at the base clock speed of 2.7 GHz with Turbo Boost technology to speed up processing up to 3.5GHz. It does support Hyper Threading technology to process up to 4 threads at once. It has an integrated GPU called Intel HD Graphics 620 graphics card clocked at 300 - 1000 MHz. 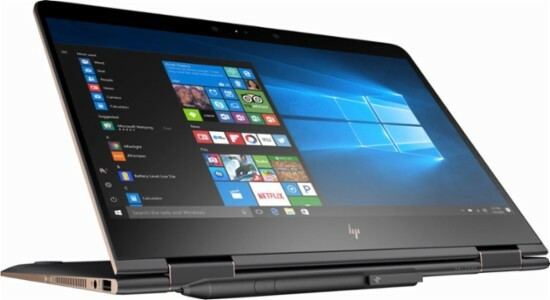 The HP SPECTRE X360 13-AC063DX laptop PC is equipped with 8GB system memory for advanced multitasking; 256GB solid state drive (SSD) that offers less storage space than a hard disk drive, a flash-based SSD has no moving parts, resulting in faster start-up times and data access, no noise, and reduced heat production and power draw on the battery; Bang & Olufsen Audio, HP Audio Boost; Convertible design to seamlessly switch between high-functioning laptop and portable tablet forms; HP TrueVision HD webcam with dual-array digital microphone; and 3-cell battery to be able to use this laptop whenever you are away from the main source of electricity up to 14 hours. It comes in HP finish in dark ash silver for stylish look. It is also comes packed with software packages such as HP Recovery Manager, HP Support Assistant, HP ePrint, Netflix, McAfee LiveSafe (30 days trial), HP 3D DriveGuard, HP Audio Switch, HP JumpStart and HP Sure Connect 2.0. This laptop PC comes equipped with 13.3" Full HD multitouch screen with 1920 x 1080 resolution resolution. The resolution of this laptop is not that high compared to other laptops, it is expected that the display of this laptop is not that sharp and clear compared to laptops with higher screen resolution. The display also features energy-efficient WLED backlight technology. With regards to connectivity, this laptop comes packed with SuperSpeed 10Gbs USB 3.1 port; Bluetooth interface syncs with compatible devices; 1 USB Type-C port; Thunderbolt port for connecting advanced monitors and external drives; HDMI output expands your viewing options; Next-generation wireless connectivity. This HP SPECTRE X360 13-AC063DX is powered by Windows 10 operating system that 10 brings back the Start Menu from Windows 7 and introduces new features, like the Edge Web browser that lets you markup Web pages on your screen. This laptop has the following dimensions: 0.6 inches x 12.1 inches x 8.6 inches and weighs about 2.89 pounds. You can get this laptop PC at the price of $949.99. Other laptop in this price range includes GOOGLE PIXELBOOK GA00122-US; Samsung - Galaxy TabPro S 2-in-1 SM-W700NZDBXAR; and DELL INSPIRON I7373-7227GRY-PUS . Do you own this laptop computer. Please let us know your experiences with this device.